Want to have the Mac Dock in the corner of the screen? 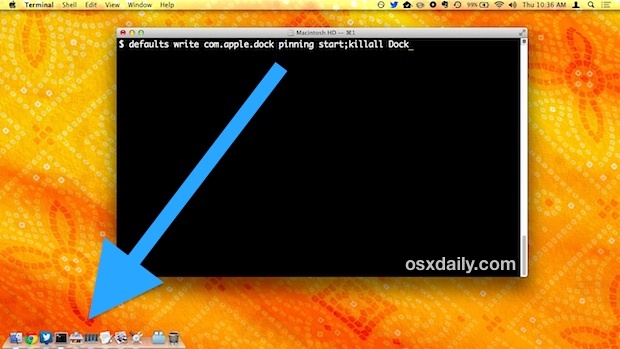 The Mac OS X Dock sits centered along the bottom of the screen on every Mac by default, and most users probably assume that moving the Dock to a new location is limited to centering on either the left or right side of the screen. It turns out you can actually have much more control over the Dock positioning, and with the help of a little defaults command string you can actually pin the Dock into the corner of the Mac display. The tricks to move the Mac Dock into a corner of the display works in MacOS Mojave, High Sierra, Sierra, El Capitan, Yosemite, and Mac OS X Mavericks, and presumably all future versions of MacOS too. 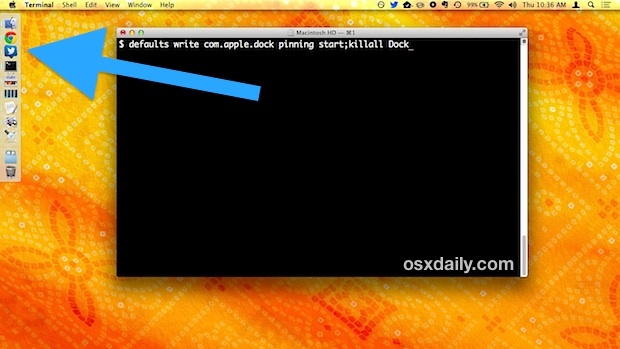 We’ll break up the steps to place the Dock into the screen corner of a Mac, first let’s start by putting the Dock into the generally desired region of the screen, before launching Terminal to issue a command to put the Dock into the corner rather than simply the side of the Mac screen. First you will want to put the Dock into the general area of the screen that you want it to be. So if you want the Dock to be positioned horizontally in a bottom left or right corner, just leave it as is the default setting. If you want the Dock pinned to the corner on the left, move the Dock to the left side, and if you want the Dock to be in the right side corner, drag the Dock over there first. You can also hold down the “Shift” key and use the resize bar to drag it to a new side of the screen, but that can be confusing for some users since it’s a bit more subtle. Keep that in mind when choosing the Docks location using the following commands. The Dock will be killed and the change will take effect instantly. Which corner the Dock sits in will depend on what side of the screen it started on (or is moved to. Again, position the Dock in the region of the screen where you want it to appear, it will be on the right side if along the bottom horizontally. The Dock will appear in lower right or left corner if it’s positioned vertically. Notice you can continue to resize the Dock regardless of it’s positioning on the screen. 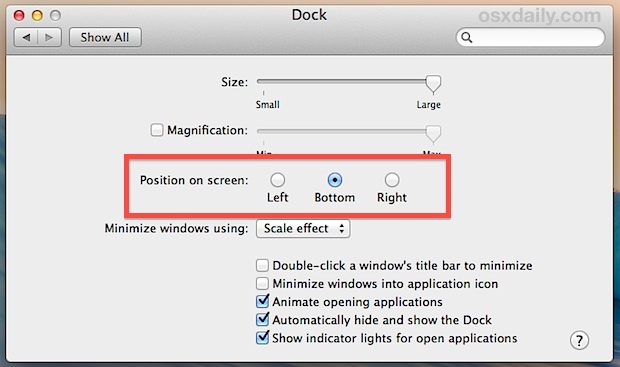 Yes, this will impact where the Dock shows up on multi-display configurations running Mavericks, in other words, if you move the Dock into the bottom left corner, you will need to gesture your mouse cursor into that corner to make the Dock appear there on the secondary external display as covered here. Again, the Dock will refresh automatically, and you’ll be back to the normal. Does this only work with the Dock in Mac OS X? Notice the difference? It’s very subtle, capitalizing “com.apple.Dock” for earlier versions of Mac OS X, while keeping it lowercase in Mac OS X Mavericks and later. Otherwise everything else is the same. 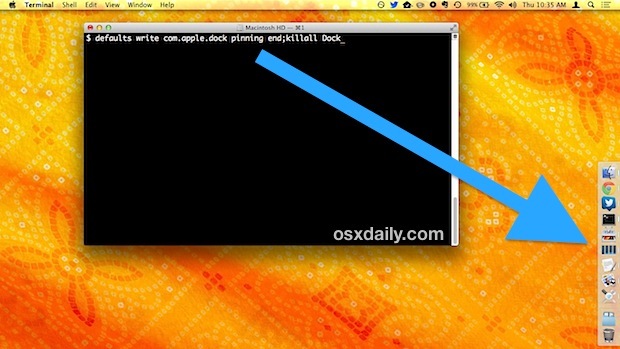 Thanks to to MacFixIt for discovering this trick for earlier versions of Mac OS X. One of the commenters (see the comment by Whitedog) on MacFixit mentioned that the free TinkerTool (http://www.bresink.com/osx/TinkerTool.html) has a GUI interface for this. Much easier than using defaults. Is it possible to have it on the left and right so say if you have a dual screen set up side by side it shows up on the left hand side of the left screen and right side of the right screen? how about on d top?? Did Yosemite kill this method? It appears to be the case, JP. Or, until someone finds a method to do it again.